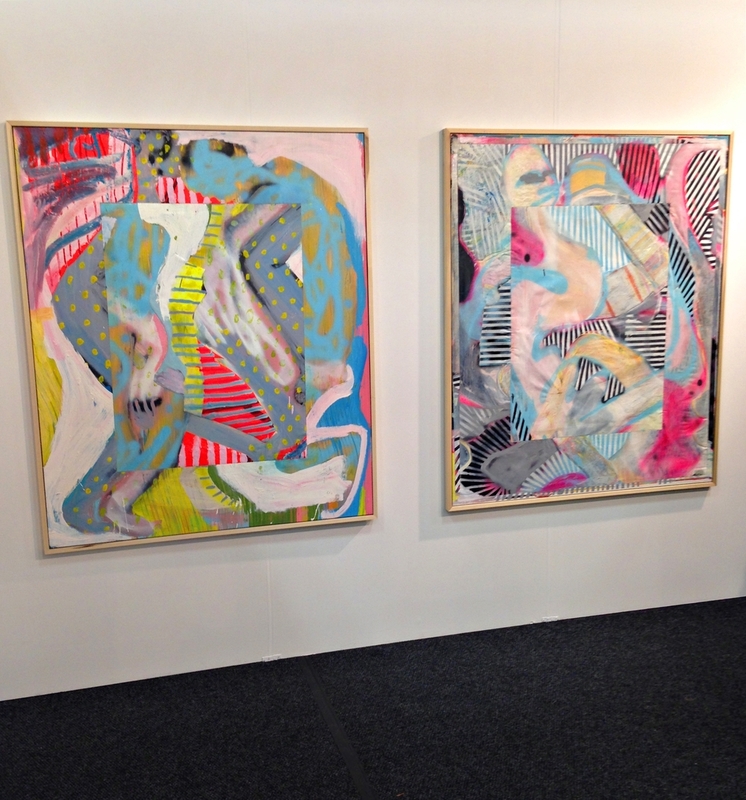 I really think that NADA is becoming my favorite emerging art fair. The one in New York last week didn't disappoint and the space was ripe with new and original talent that was exciting and fun to discover. Austin Eddy with Roberto Paradise was a hit. His canvases mixed romanticism and cubism a la Picasso in a way that felt really fresh. The pieces which had intricate details incorporated airbrush, graphite and acrylic on raw canvas -- he was one of my favorite discoveries. Katherine Bernhardt, whose pieces were also at Frieze and in several booths at Nada, continues to consistently prove how good of a painter she is. Her portraits are still the biggest winners to me, a series of which were hanging on the uber original booth that The Hole created for the fair. David Castillo had a solo exhibit of Xaviera Simmons, showing some of her outstanding photographic "indexes" which were featured here last year in a studio visit we did with her. Among my abstract highlights were Freight + Volume’s excellent large scale paintings by Ezra Johnson. Saira McLaren's medium size canvases with Sargent's Daughters along with The Hole's paintings by Kasper Sonne made with chemicals on canvases were true standouts. Romania artist Razvan Boar showed romantic, subtle and very well-executed canvases depicting human bodies that verged on the border of caricaturesque and poetic. Jessee Greenberg's sculptural resin, metal and paint pieces shown with Loyal Gallery, were unique, intriguing and strong in every sense of the word.